Fighters are characters that subdues enemies with continuous close range attacks using a glove. High in survival rate due to high HP, suitable for intermediate players. - ATK: as high as possible (Stamina+, ATK+). - CRIT RATE: just aim for at least 40% or more (CRIT RATE+%). 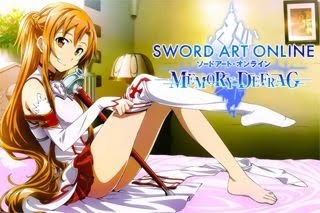 - DEF: Collect and upgrade your gears to get the DEF bonuses, if you need more, get (DEX+, DEF+, STR+). Aim for 700+ or 800+ for Chapter 8 and 9 Normal. - Evasion: Getting this around 40% will also help dodge some attacks (Evasion+%, DEX+, Stamina+). 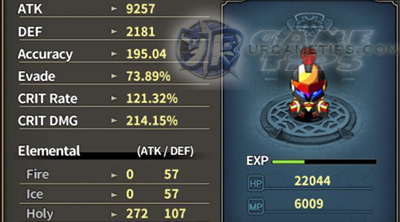 - CRIT RATE: just cap it around 100%+ (CRIT RATE+%), increase if you need more chance but do not exceed far from 200%. - CRIT DMG: aim for at least 100%+ (CRIT DMG+%, DEX+), then 200% or more around Lvl 50. - DEF: aim for at least 2000+ DEF around Lvl 50 and above. (DEX+, DEF+, STR+). Your "DEF Increase" passive skill will also start to give great bonuses at this point too. - Evasion: Just cap it around 100% or less (Evasion+%, DEX+, Stamina+) to help dodge some attacks. Increase at higher Lvls if you need more. - Accuracy: Only increase if you miss a lot in PvE, or increase to around 200+ to 250+ for PVP purposes (Accuracy+). If you are a PVP enthusiast , you need to increase this more, unless the meta changes and everyone drops their Evasion. - MP: Leave it for now, or just get the bonus MP+ from Necklace upgrade bonus and Seals. - Note: Stats above are not fully optimized, there is still room for improvement. Once you reach and get the Lvl 60 weapon, ATK and other stats will greatly buff up, pick wisely. Add in more Accuracy (reach around 250), HP, DEF, CRIT DMG or any stats according to your needs or play style. - Main Skills: Full Blast, Lion's Roar, and Life Circulation. 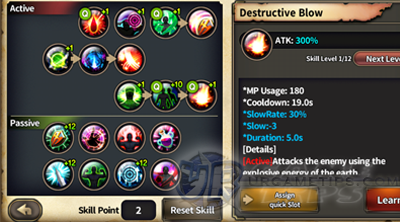 - The bonuses of the 3 passive skills above isn't great early game but it will be very helpful as you go higher. Note that the Deadly Will passive skill will modify your CRIT RATE by it's current percentage, it doesn't add as is. - Blessing of Fortitude: Good early game, but the bonus is not very satisfying at higher levels, just throw in your extra skill points here late game. - Main Skills: Lion's Roar, Empowered Light and Shadow Double. - Situational Skills: Battle Cry (can be used once you have a decent CRIT RATE, also good for Raids.) Life Circulation for more survivability, or simply add Full Blast for extra damage and invulnerability. - Shadow Double's DPS is kinda shaky but it's very useful for certain stages. It can be used to absorb damages, or as dummies for powerful boss skills and annoying disabilities like stun or grabs. If used correctly, they can also mob and destroy bosses! - If Auto Potion is disrupting your Empowered Light's timing, turn it off every time you enter dungeons. - Empowered Light can also cover your MP, but once you have a nice MP pool (from Necklace upgrades), you might want to start using HP Pots and Max HP for dungeon runs. - Chapters 9-5 to 9-10: If you are having trouble, just use Shadow Double to clear the mobs, move to a safe place, wait for cooldown, repeat. Use Empowered Light to restore MP. 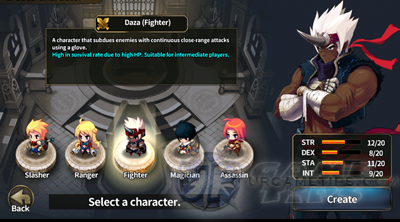 - Recommend: Upgrade your gears, battle pets, fairies, and increase Awakening Stars for easier clear. - Main Skills: Destructive Blow, Empowered Light and Shadow Double. - Example Basic Combo: Gather Mobs > Shadow Double > Destructive Blow. This will help cast Destructive Blow at full strength and without getting damages. - Passive Master = MAX next (increases the base bonus stat of all passive skills, a nice skill at higher levels). Reserve or put Skill Points here, and wait until it is fixed. - Blessing of Fortitude = Put remaining skill points here. - Note: Passive Master and Focus are NOT working (at the moment, stats doesn't increase at certain Lvls after Lvl 1). - Focus = Optional skill at higher levels. How it works? Ex: If you have 400 STA and Lvl 10 Discipline (+30% DMG per STA), you'll get 400*.30 = +120 ATK. - Blood Drain = This is also an optional skill for CRIT Builds, some players put up to 4 Skill Points here to trigger Life Steals ("Didn't test personally, how effective though"). Note: Chance Rate increases by 2% per upgrade. So far the popular choice is Destroyer Set. Upgrade your weapons to higher Lvl and Grades, start aiming for SS weapons once you reach the Hashina Set at Lvl 30+. Weapons can be set or no-set depends on the availability of in-game items. - Hashina Set = Upgrade to Grade SS, use until Lvl 49. Start aiming for gears with +1 Gem Slot to get more stat bonuses. Note that this is not the only way, just a suggestion.